The aural perception of space consists of two basic components. Our auditory faculty can recognise early reflections from ceilings, side walls, rear walls and so forth as separate reflections of a direct signal and, at the same time, perceive them altogether as a sonic event. 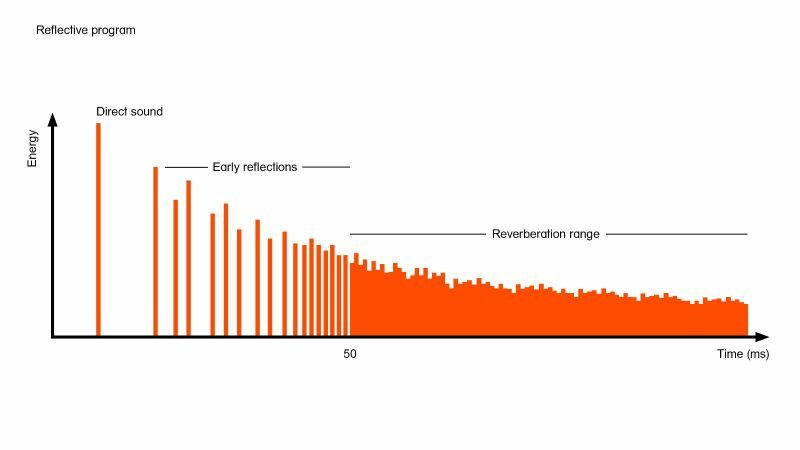 From at least 80 milliseconds after the direct sound, the isolated reflections combine to form an overall reverberation. Only very strong reflections, e.g. from hard parallel walls, are still perceived as separate. These late strong reflections are referred to as “flutter echoes”. -the reverberation and the way everything might sound in an empty auditorium. The simulated reverberations, though patterned after well-known concert halls, merely approximate the sound in an actual hall. Our concern is not to evaluate the halls but to demonstrate acoustical effects and influences. Flautist Natalie Schwaabe in the anechoic chamber of Munich’s Institute of Broadcasting Technology (IRT). Natalie Schwaabe has ventured into the anechoic chamber to record an excerpt from Olivier Messiaens’ “Le Merle Noir”. In Example 1 you hear the pure sound of the flute without any reflections. Example 2 contains, in addition to the direct signal, early reflections from a fairly bright and clear-sounding concert hall (the simulation imitates Baden-Baden Festival Hall). Example 3 adds early reflections from a richly resonant hall (an approximation of the Amsterdam Concertgebouw). Comparing the two, you can readily hear that Example 2 is darker in timbre. The reflections last a very long time and yet are very dense and loud. In contrast, the reflections in Example 1 (Baden-Baden) are less “isolated” and decay much more rapidly. Examples 4 and 5 compare reverberation in the two halls. Once again they differ in timbre and clarity. Example 4 (Baden-Baden) sounds brighter and slightly more agitated, whereas Example 5 (Concertgebouw) is darker in timbre but fades away very smoothly. Examples 6 and 7 illustrate a possible overall impression in a concert hall. Unfortunately, the direction of the reflections cannot be reproduced as accurately in simulations as we perceive them in reality. If we actually had an opportunity to record the same piece of music in different concert halls, the difference would become much more apparent. Nevertheless, the examples offer a glimpse into the rich world of spatial acoustics.